“People know instinctively that the arts and creativity are good for them….whether that is singing in the bath, watching a movie, contemplating a painting, dancing to the radio in the kitchen or reading a book. What we aim to do at Arts & Minds is support people to engage with their creative urge and give them the tools with which to do it. Arts participation is strongly associated with positive mental wellbeing. mental health, and a variety of long term health conditions. outcomes, in different patient populations. The act of art production is associated with improvements in mood and increased mental resilience. wellbeing, social isolation, and anxiety or depression for people with mental health problems. overall savings for the public sector compared to current standard-of-care alone. The positive effect of arts-based programmes on mental health is also evident in the workplace. Arts and Minds aspire to a world where people have the confidence and self-esteem to lead fulfilling lives. 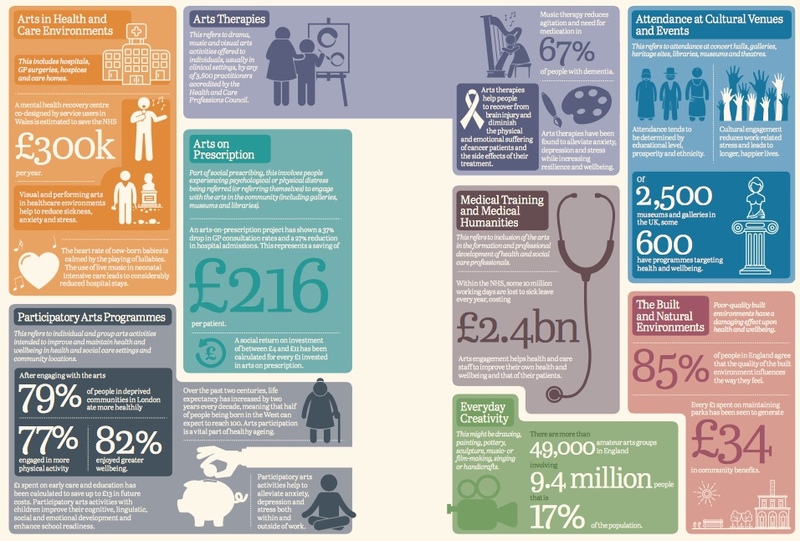 Arts and Minds believe that experiencing high quality arts provision as participant and audience can play a vital role in achieving this for individuals, health and social care professionals and communities. Arts and Minds seeks to expand its capacity to deliver an experience of the creative arts and culture to as many people who experience mental ill health and their carers as possible. A working knowledge of the unmet need for this kind of arts intervention makes it a viable area of development for a third sector organisation within health and social care. Plans include expanding Arts on Prescription to different age groups, across a wider geographic area and to reintroduce ward based projects.